“As my brunch friends and I continued talking about Michelle, our conversation wandered into one area we seldom discuss, even among our families and closest confidantes. 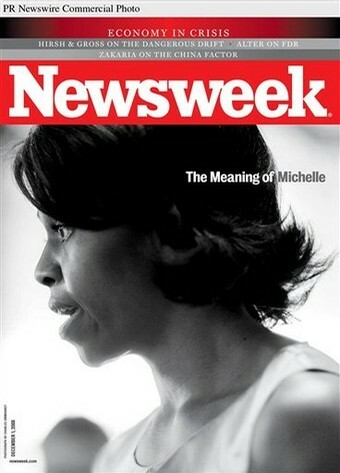 Michelle is not only African-American, but brown. Real brown. In an era when beauty is often defined on television, in magazines and in movies as fair or white skin, long straight hair and keen features, Michelle looks nothing like the supermodels who rule the catwalks or the porcelain-faced actresses who hawk must-have cosmetics. Yet now she’s going to grace the March cover of Vogue magazine–the ultimate affirmation of beauty. Who and what is beautiful has long been a source of pain, anger and frustration in the African-American community. In too many cases, beauty for black women (and even black men) has meant fair skin, “good hair” and dainty facial features. Over the years, African-American icons like Lena Horne, Dorothy Dandridge, Halle Berry and Beyoncé–while beautiful and talented–haven’t exactly represented the diversity of complexions and features of most black women in this country. King James or King Kong? ?